Try out this restaurant-style Vegan Pizza Recipe in the comfort of your own home. It’s easy to make and delivers the most delicious crust. It’s crispy on the outside and fluffy on the inside. Everyone needs a good Vegan Pizza Recipe in their life. Amirite? However, nobody wants a pizza recipe that is difficult to follow or takes hours for the dough to rise. 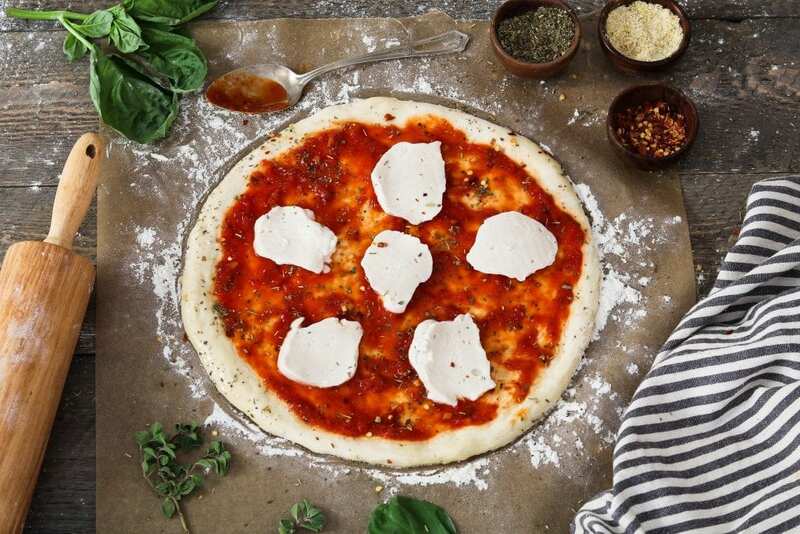 Well, this Vegan Pizza Recipe will put the fun back in pizza making. It’s so easy to make and will be on your table in just one hour (or less). Most of that time is just waiting for the dough, so you can sit back and relax while that’s going on. 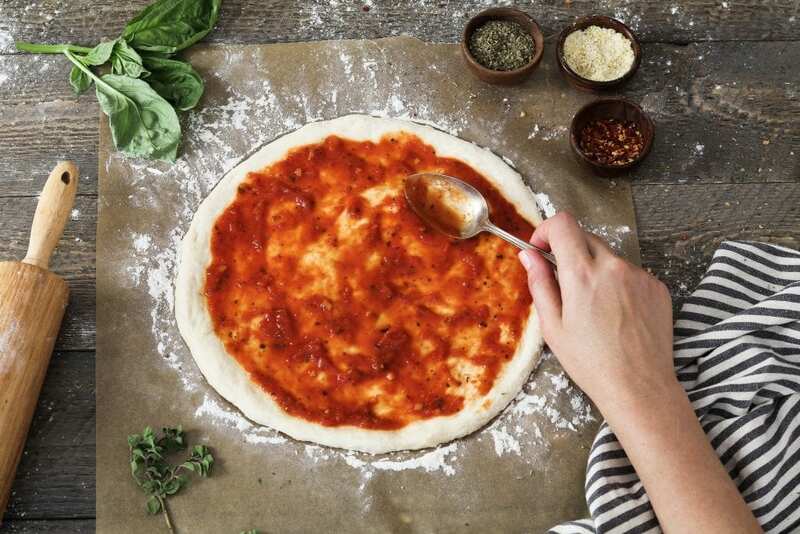 For the pizza dough, you’ll need warm water, fast-acting yeast, all-purpose flour, olive oil, sugar, salt and garlic powder. You can top your pizza with anything you’d like so have fun with it. 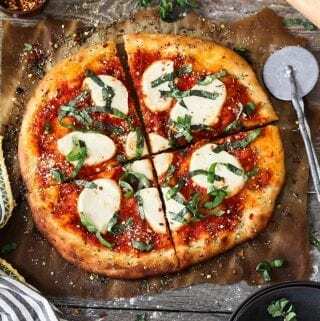 I kept it simple and added marinara sauce, dried herbs, fresh basil and homemade vegan mozzarella cheese. Any store-bought melty vegan cheese will work well too. 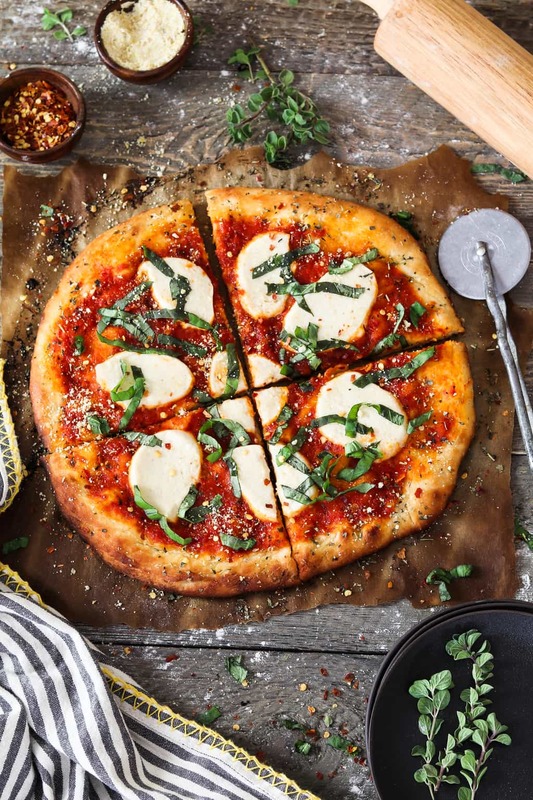 If you make this Vegan Pizza Recipe, I’d love to hear what you think in the comment section below. It would really make my day. You can also follow me on Instagram and share your creation with me. Just tag me @veganhuggs and hashtag #veganhuggs so I don’t miss it. Try out this restaurant-style Vegan Pizza Recipe in the comfort of your own home. It's easy to make and delivers the most delicious crust. In a large bowl, add the flour, garlic powder, salt and remaining sugar. Whisk to combine. Add the activated yeast to the bowl along with the olive oil. Mix until all ingredients are well combined and form a dough. If dough is too sticky, add a couple tablespoons of flour. Using a spoon, spread the sauce evenly over the pizza and top with the mozzarella. * Nutritional info does not contain the mozzarella cheese topping. Best home-made pizza I’ve ever tasted! Excellent results. Did not have parchment paper. I sprinkled some flour on a regular cookie sheet. Worked fine. No stick. Thanks for a keeper.